Care.v Meadii Dewey, Am. Journ. Sci. 43: 90. 1842. Similar to the following species, glabrous, culm stouter, strongly phyllopodic, not purplish-tinged, very rough above, 8'-18' tall. Rootstocks elongated, deep-seated, slender; leaves flat, those of the fertile culm usually 6-10, 1 1/2"-3 1/2" wide; bracts short, not overtopping the spikes; staminate spike long-stalked; pistillate spikes 1-3, sometimes staminate at the summit, rarely compound at the base, oblong-cylindric, densely 8-30-flowered, 1/2'- 11 /2' long, about 3" in diameter, erect, stalked, or the upper one sessile, the lower often very long-stalked; perigynia obovoid, obtusely triangular, prominently many-nerved, green, 1 1/2" long, about 1" in diameter, tipped with a minute slightly bent beak; scales ovate, green with reddish-brown or purple-brown margins, obtuse to cuspidate, and from much shorter than to exceeding perigynia; stigmas 3. In swamps and wet meadows, New Jersey and Pennsylvania to Georgia, Michigan, Assiniboia, Nebraska and Arkansas. May-July. C. tetanica Schk. Riedgr. Nachtr. 68. figs. 100, 207. 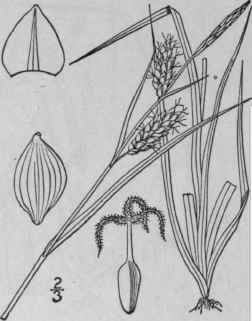 1806* Carex tetanica var. Woodii Bailey, Mem. Torr. Club 1: 53. 1889. Light green and glabrous, or sheaths slightly puberu-lent, culms slender, more or less strongly phyllopodic, not strongly purplish-tinged at base, erect, rough above, 6'-2° tall. Rootstocks elongated, deep-seated, white, slender; leaves flat, those of the fertile culm usually 3-5, i"-i 3/4" wide, shorter than the culm; bracts narrow, elongated, usually shorter than the spikes, sheathing; staminate spike long-stalked; pistillate spikes 1 to 3, erect, distant, narrowed at the base, compactly 6-20-flowered or attenuate at base, linear, 1' long or less, the lower filiform-stalked and often drooping; perigynia oblong-obovoid, green, prominently many-nerved, about 1 1/2" long and 1" thick, obtusely triangular, abruptly minutely beaked or beakless, the orifice entire; scales ovate, obtuse or mucronate, usually shorter than the perigynia; stigmas 3. In meadows and wet woods, Massachusetts to Manitoba, south to District of Columbia and Missouri. June-July. Carex colorata Mackenzie, Bull. Torr. Club 37: 232. 1910. 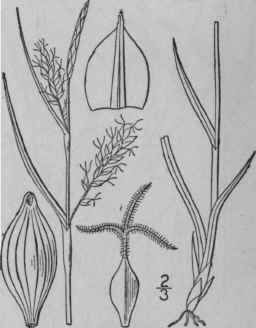 Light green and glabrous, culms slender, aphyllo-podic and strongly purplish-tinged at base, strongly stoloniferous, erect, roughened above, 1°-2° tall. 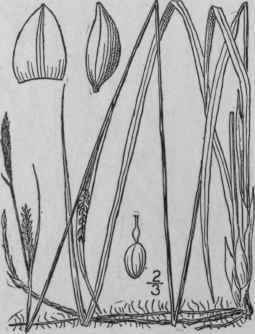 Leaves flat, those of the fertile culm usually 2-4, 1 1/4"-2" wide, shorter than the culm; bracts narrow, elongated, usually not exceeding the spikes, sheathing; staminate spike more or less peduncled; pistillate spikes 2-3, erect, distant, rather loosely 6-15-flowered, linear, 7"-18" long, 2" thick, on slender much-exserted peduncles; perigynia narrowly obovoid, obtusely triangular, lightly many-nerved, 1 3/4"-2" long, 3/4" wide, tapering at both ends, the beak 1/4" long, slightly curving, the orifice oblique; scales ovate, obtuse to cuspidate, shorter than the perigynia; stigmas 3. Woodlands, New York and Ontario to Michigan and Manitoba. May-June.